PAN plays home to the return of pioneering composer Erik Wiegand a.k.a. Errorsmith - in collaboration with anterior artist Mark Fell, no less - for his first release in eleven years! Technically, it's not the first time that these two have worked together - Fell put Wiegand's Razor software to stunning use in the 'Manitutshu' album (EMEGO 116, 2011) - but it is their first time recording together, and with unpredictably brilliant, skewed results. 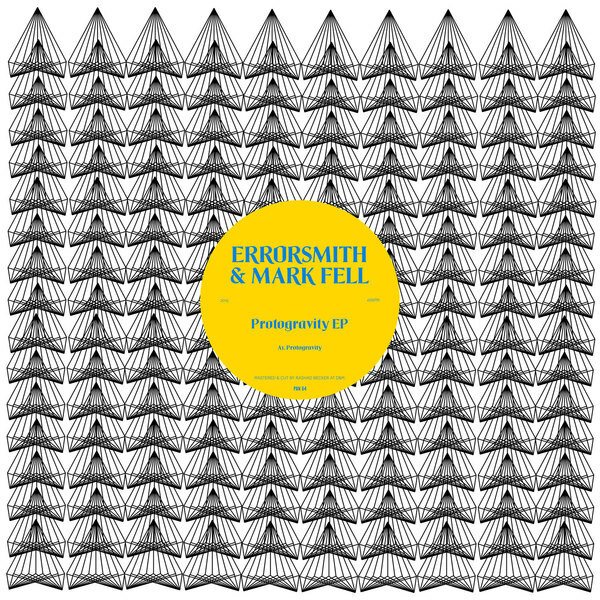 Realised in June 2014 at Errorsmith's studio in Berlin, 'Protogravity' features the duo modestly showing off their minimalist chops and avant-garde sensibilities while keeping one ear firmly focussed on the 'floor in a fashion that has catalysed some of the finest dance music of the last 20 years thru their respective collaborations: Erik with Soundhack in Smith 'N Hack and with Fiedel as MMM; and Fell as half of SND and more recently with DJ Sprinkles and Gábor Lázár. The A-side, 'Protogravity' is a masterstroke of louche, sub-tropical futurism, mixing hi-tech bashment-house impulses with haunting female vocal and DMT-exhaling pads. B-side, their 'Cuica Digitales', with its arresting throat singing and spasmodic chromatic splashes, comes off like a freakish carnival/funeral march, and the entirely instrumental 'Atomic #80' pushes similarly outernational drum patterns thru a barrage of reflective FX, recalling Errorsmith's rigorously ascetic, now legendary, pair of solo releases as much as Fell's Sensate Focus gear. Tungsten tipped - one of our favourite PAN releases ever this! Our 12" of the year!